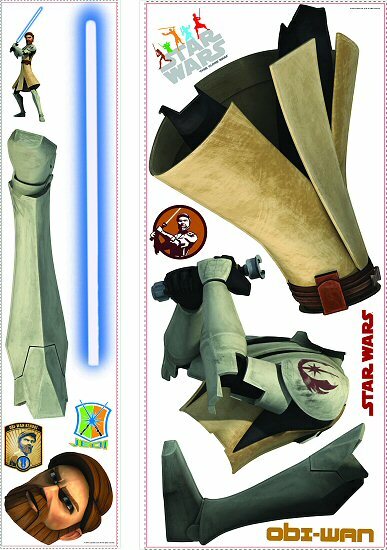 Bring the spirit of the Force right into your child's room with this repositionable Obi-Wan Kenobi giant wall decal set. A favorite hero from the animated hit series Star Wars: The Clone Wars, Obi-Wan stands close to 5 feet tall (plus lightsaber) and wields an amazing glow-in-the-dark lightsaber! Complete with 7 extra accent pieces, your child will love the fun Clone Wars atmosphere created by this out-of-this-world character and you will love how easy it is to tranform a room in minutes with this RoomMates peel and stick Star Wars Obi-Wan mini mural set. 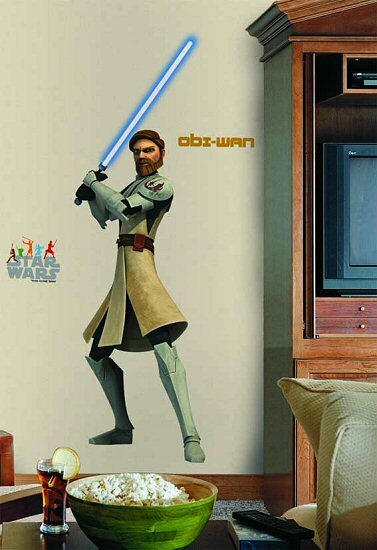 Our Star Wars Obi-Wan peel and stick giant wall decals (also known as peel and stick murals) are repositionable, removable, re-usable, and washable... the perfect combination for decorating the bedrooms and playrooms of kids. This RoomMates Star Wars Obi-Wan repositionable giant wall decals set offers decorating ease with no damage or residue to the surface. Note: © 2009 Lucasfilm Ltd. & TM. All rights reserved.